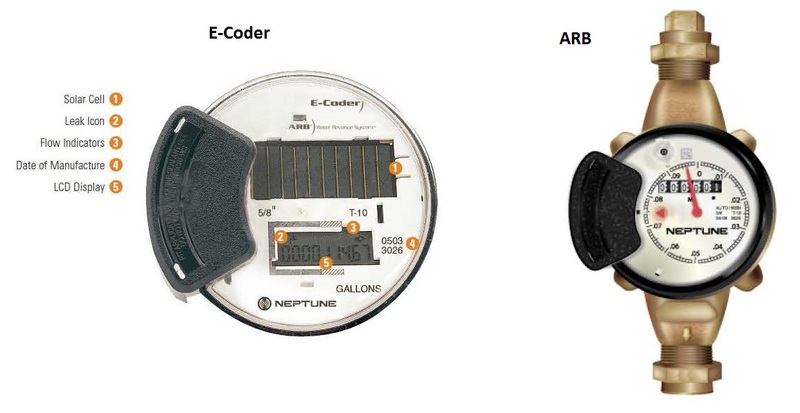 There are two types of water meters: Neptune ARB meters and Neptune E-Coder meters. Locate your meter in your basement. It is usually located along the back wall. Once located, locate the reading on the screen. You can compare this reading to the one on your most recent water bill to calculate how many gallons of water your household has utilized since the printing of that bill. It is never a bad idea to monitor your monthly, weekly, or even daily water usage. If you feel that your water bill is unusually high at any point in time, you can also look at your water meter to check if there might be a leak somewhere in your home. On the face of the meter, there is a small red or black diamond or triangle towards the middle. This is the leak indicator. If at any time it is spinning, that means there is water going through the meter at that exact moment. If no one in your home is using water at the time you are viewing your water meter, the leak indicator should be completely still. If it is not, then you have a leak somewhere in your home. In the majority of situations, a running toilet is the cause of high water usage. If you are interested in reading your Neptune E-Coder water meter, click here. If you locate your meter and find that the screen looks dark with nothing on it, you have a Neptune E-Coder meter and will need to use a bright flashlight to wake it up. Some properties have water meters located in meter pits outside of the home. If your home has a meter pit, you can lift the meter pit lid and view your water meter that way.